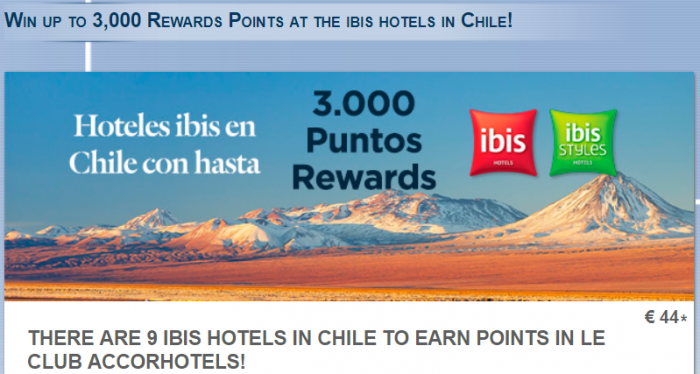 Le Club AccorHotels has launched new promotion for Ibis stays in Chile during the Southern Summer. Le Club AccorHotels members can earn up to 3,000 bonus points for three stays that are both booked and consumed between December 1 – January 31, 2018. Registration for this offer is required. Note that there is a minimum stay of two nights for each of the qualifying stay. Some love for those that tend to stay at Ibis branded properties in Chile. Considering the rates that they charge, this could be a nice rebate of the rate paid. 1. The terms and general conditions of Le Club AccorHotels apply to the offer Up to 3000 Points and it is necessary to be a member of Le Club AccorHotels in order to benefit from it. 2. This offer allows members of Le Club AccorHotels, regardless of their status, to earn up to 3000 Rewards points for a stay in one of the hotels participating in the Le Club AccorHotels loyalty program. These extra Rewards points are offered in addition to the Rewards points and Status points normally obtained by the Le Club AccorHotels members in their eligible stay and according to the terms and conditions of use Le Club AccorHotels. The number of Rewards points of this offer is calculated according to the points obtained by the member based on the Classic status. 3. This offer is for a stay from 01/12/2017 until 01/31/2018 at one of the participating hotels of Chile, which has been reserved between 01/12/2017 and 31/01/2018. 4. The stay must be a minimum of 2 night (s). 5. The consecutive stays (check-out and check-in the same day) in the same hotel, are considered simple stays. This simple stay will be eligible only once in the Up to 3000 Points offer. 6. Within the framework of this offer, one (1) stay is considered each reservation of one or more rooms in a participating hotel made by a member of Le Club AccorHotels. To avoid any doubt, if a reservation is made for more than one room, it will be considered as one (1) single stay. 7. To benefit from this offer, the reservation must be made through the Accorhotels.com page, the pages and applications of the participating brands and through AccorHotels booking centers. The other booking channels are not included in this offer. 8. You must indicate your Le Club AccorHotels loyalty card number at the time of making your reservation and present it at the hotel reception when you check-in. 9. Rewards Le Club AccorHotels points are credited to the member’s account 10 days after the end of the stay. 11. The stays paid totally or partially with Rewards points or with one or several Le Club AccorHotels vouchers, will not be eligible for this offer and can not be counted as stays linked to this offer. To be able to enjoy the offer, up to 3000 points must be registered before booking.